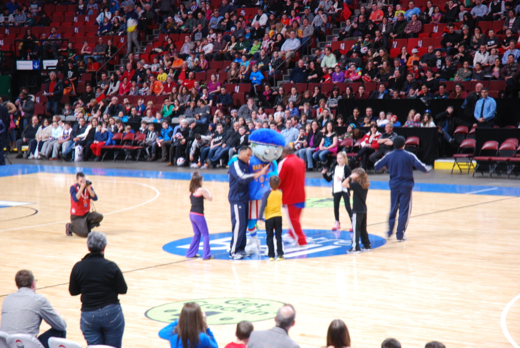 As a Harlem Globetrotters ambassador, I recently got the chance to attend their 2014 “Fans Rule” tour. This was the first time taking my 2-year-old daughter to a big event, so I was excited to see her reaction to sitting in such a big arena and watching a performance. My family was invited to a meet and greet with the Harlem Globetrotters team one hour before the game started. We got to go sit in the court side seats and soak up the atmosphere. It was super cool looking up at 1000’s of people and lets just say I got a whole new level of respect for performers! Ava (my daughter) was certainly mystified by the vast arena. 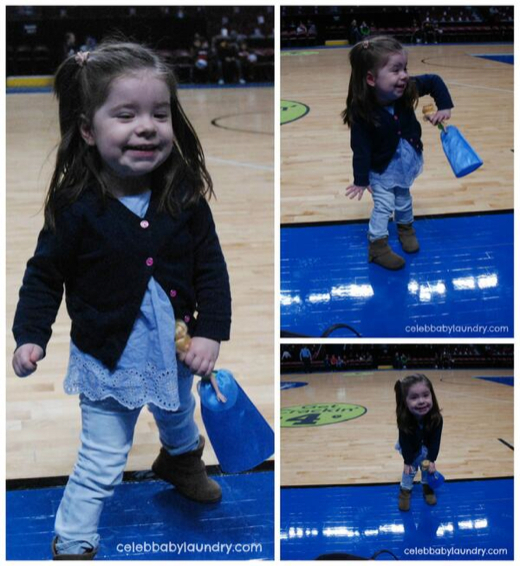 Like most young children, she had no idea she was the centre of attention as she ran onto the court area. She started doing basketball moves and dancing around to the music. It was truly one of those moments you will never forget as a parent. After about 30 minutes, we were escorted backstage where we waited to meet with two members of the Harlem Globetrotters team. The players were very friendly and gracious. They laughed to see my daughter who was probably their smallest pint-sized fan! The players happily posed for pictures with us. Before we knew it, it was time for the game to start. The Harlem Globetrotters mascot and two break dancers came out to warm up the audience. Ava absolutely loved the mascot and I had stop her from running down to see him! He is perfect for young children and did a great job of inciting the kids to clap and scream. There was never a dull moment during the game. The game is family-oriented with fun gags and jokes that are appropriate for all member of the family. You also don’t need to know anything about basketball to love the Globetrotters. The goal of the game is to get children to interact and have fun while doing so. That’s why there letting fans vote on new rules of the game this year. Before you go to a game, head to the Globetrotters website and pick the rule you and your kids want to see in your game. 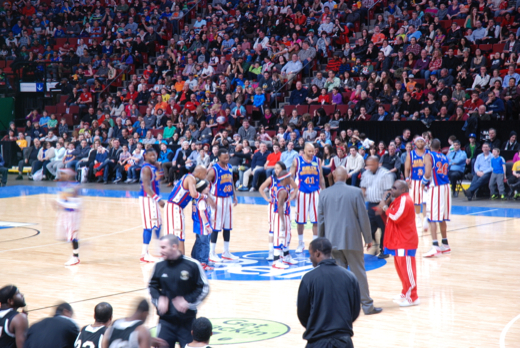 The Harlem Globetrotters are extremely talented and there athletic ability is showcased to the max during the show. I particularly enjoyed Hi-Lite who was the main Globetrotter. He did a great job at keeping everyone involved and gave a great comedic performance. The various dances were also fun and one was even choreographed by Mark Ballas of Dancing with the Stars. This new dance is performed by the Globetrotter at every game. To see a behind the scenes look, check out ET Online. The Globetrotters continue their 2014 ‘Fans Rule’ tour throughout the U.S. and Canada through the end of April. In all, Globetrotters’ tour will visit over 250 cities. 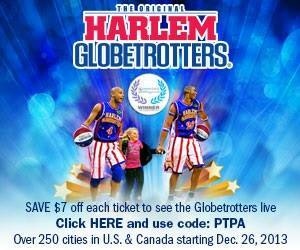 You can check out their schedule and buy tickets at the Harlem Globetrotters website. Additionally, save $7 off each ticket by using the promo code “PTPA” when you make your purchase. Disclosure: I’m part of the Harlem Globetrotters Ambassador program with PTPA and I receive special perks as part of my affiliation with this group. The opinions on this blog are my own.